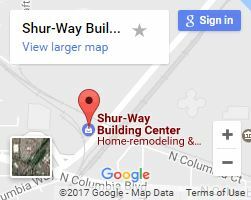 Then come to Shur-way Building Centers! With an emphasis on decking other outdoor projects, you’re sure to find the deck materials you need for your Portland home. Not sure what that is? Don’t be embarrassed! We understand that there’s a lot of research that goes into choosing that perfect material that has the durability, style, and look that you want. We’ve worked with these materials for years, and have the tried-and-true experience that can’t be gained any other way. Which material do you need? It depends on what’s important to you! Each has their own advantages and disadvantages, so depending on your needs and circumstances, one might be the clear winner for you. Wood looks the most natural and unique. No two pieces are exactly the same, even from the same tree. A wood deck is a cheaper option. Sometimes the initial cost is half as much as other choices. However, wood requires regular maintenance. It may need to be treated or resealed frequently. Wood is also more prone to nature damage. Termites and strong weather can hurt its structural integrity. 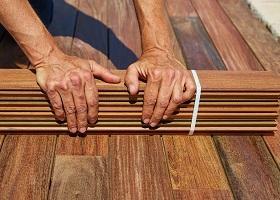 Composite decks are made from artificial materials. Because of this, they are purposefully built to be a more durable option, but have a high cost of manufacturing. Composite decks are generally stronger. They can withstand a significant amount of force without damage. A composite deck is usually environmentally friendly. Sometimes, over half of the materials are recycled. These decks are easy to clean. They are stain resistant, and most spills won’t seep deeply into them. However, a quality composite deck is expensive. They may cost twice as much as their wood counterpart. They also don’t have the same level of authenticity. They can look more factory-made than wood. Come to us for your deck ideas! Know what you want but not how you want it to look? Then look at our gallery for ideas! Whether you know exactly what material you want and what you’re doing with it or only know you want some kind of deck, we’re here to help. So fill out our contact form, give us a call, or just stop by and we’ll be happy to assist you!